Jennifer Murgia is an author who writes YA fiction and I’ve been in love with her books for quite a while. I devoured Between These Lines and Forest of Whispers. You can imagine that I was more than a little excited when I found out that Forest of Whispers was getting a sequel: Castle of Sighs. For the occasion of it’s release I asked Jennifer if she wanted to do an interview about her research processes. The thing is that both FoW and CoS are set in the real world (17th century Germany). And I was more than a little curious to find out how she combined the real world with a work of fiction. Forest of Whispers and Castle of Sighs take place in the Black Forest of Germany, near Burg Eltz. Did you know from the start this was where you wanted the book to take place? Yes, I did. I wanted to tell a tale that revolved around true witch hunts and most of the witch hysteria we know of began in Europe, specifically Germany. I only felt it fitting to begin my story there and tell of what sparked many witch tales to come. So often we hear of witch persecution in England or Salem, but I wanted to tell a different type of story—one that began long ago and peaked during the Hundred Year’s War. The Black Forest has always been surrounded by a veil of mystery, breathing life into many fairy tales—take Snow White, for example. But the Black Forest is a real place and it only made sense to formulate a tale that could have been true in that setting. Have you also considered to work with a complete fictional world? Yes, I have considered working in a completely fictional world for other books (particularly the one I am brewing in my head at this very moment!) but there’s a sense of satisfaction while researching for me. It helps me make a significant connection with the characters if I base a novel on truth. Where did you start with your research for the books, with maps, history books, …? And how did you keep track of everything? My research began with the Black Forest, which is not only a terrifying place in the series but a safe haven for my protagonist, Rune. I created a file that included maps, links to many online sites, including travel sites and urban legends, and numbered each significant point I wanted to include based on the sections of the books. Have you visited the locations where the books take place (e.g. Burg Eltz)? You must have come across some interesting facts in your research. Was there a particular thing that really stood out to you? Researching the witch hysteria really opened my eyes to the horror of that time. 17th century Germany was NOT a nice time to live in and so many innocent people fell victim to what could be compared to modern-day bullying—only taken to the extreme. The very idea of how women and children (and yes, men too) were tortured into producing false confessions was highly disturbing to me. Nearly 60,000 people were executed in Bamberg alone and most of it stemmed from religious uprising. So very sad. Throughout the process, was there anything that was such a pain to research that you wish you didn’t have to research it? To be honest, I enjoyed the entire research process. I learned a lot … from the herbs and plants that are native to the area of Germany depicted in the story, to how long it would take to travel by foot or horseback. I went as far as to pull up maps of the areas and follow streams in high definition from one village to the next so I would fully experience what my characters did! Which of the places you have researched for the novels (e.g. Burg Eltz or the Black Forest) did you find particular interesting to research, and why? Burg Eltz was very interesting to research. It’s such a beautiful castle that still draws flocks of tourists to it. It was owned by the same family for years and has undergone several renovations, keeping the authenticity of the time. 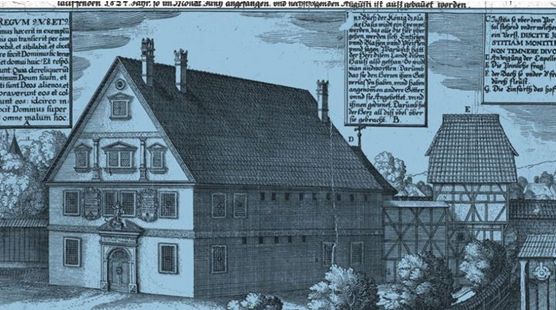 Another interesting structure in my series was the famous Drudenhaus—the witch prison in Bamberg, which is no longer standing. It was a difficult place to research since not much was found on it, but it apparently horrifying. It was sort of the last place you went to if you were found guilty of witchcraft and I can imagine it to be much like a “death house”. In general, did you like the researching process for using real places in a work of fiction? I always enjoy researching –that’s just the scholar geek in me:) It allows me to make a full connection with the story I’m striving to tell—one that is already so real in my head. Thank you so much for joining us on the blog today Jennifer Murgia. For all my visitors: Make sure to pick up a copy of any of Jennifer’s books. You won’t regret it!